As the cooler weather sets in it is not having a good effect on my skin. Aside from dryness, it's also looking dull and lifeless. I have a few products to tackle this that I wanted to share with you guys. This is by far my favourite skin brightener. I've not found anything quite like this. It's an intense mask that uses a combination of AHAs and BHAs to lift away the dead cells that leave skin looking dull. I like to leave this on for around 10 minutes and my skin is transformed. It leaves my skin feeling so soft and smooth. Not only that but it gives my skin a healthy glow to. It does tingle on application but it's nothing too uncomfortable. It's my go to whenever my skin needs a boost. Vitamin C is another great brightening ingredient. 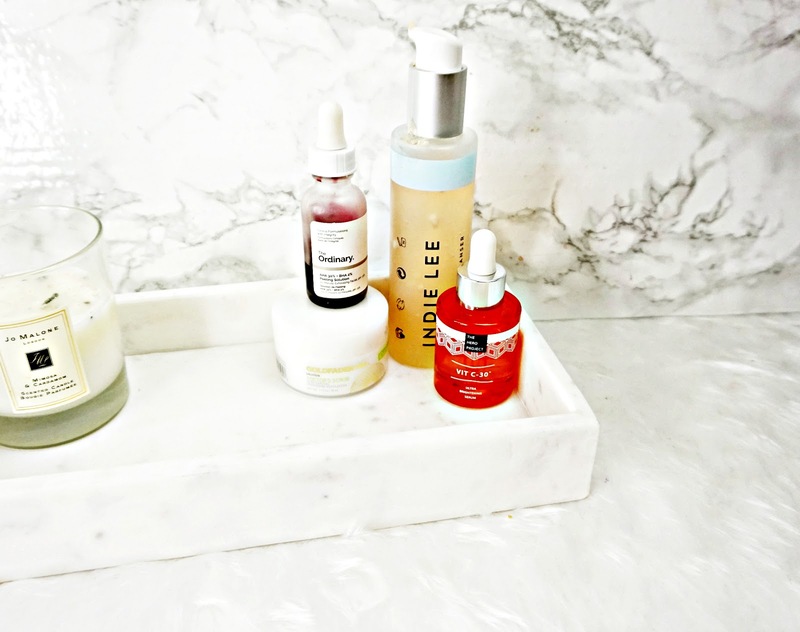 I especially love oils with Vitamin C in them in the cooler months because it's much gentler way to brighten the skin, especially if my skins feeling a little sensitive. This offering from The Hero Project has really helped keep my skin from looking Grey and dull. It's also really hydrating, it has helped keep my skin plump and hydrated. I've been using this as part of my evening and morning skincare routine and it works brilliantly in both. This is a relatively new addition to my skincare routine but one that I've been loving. This brightening cleanser is a light gel that uses hydrolysed Wheat Protein to leave the skin feeling super smooth and bright. I love how gentle this is, I tend to find some brightening cleansers a bit harsh but this has the perfect balance of being brightening, while gentle enough to use everyday. It really does also leave my skin feeling smooth to. If my skins looking particularly dull I do like to go with a manual scrub. I also really like manual scrubs in the morning before I apply my makeup to make sure my skin is super smooth. This offering from Goldfaden is on the pricy side but the results are fab. It contains tiny crystals to remove dead, flaky skin to leave the skin peachy and fresh. The crystals really work without irritating the skin. It's a brilliant quick fix. Have you tried any of these? What are your favourites for banishing dull skin?